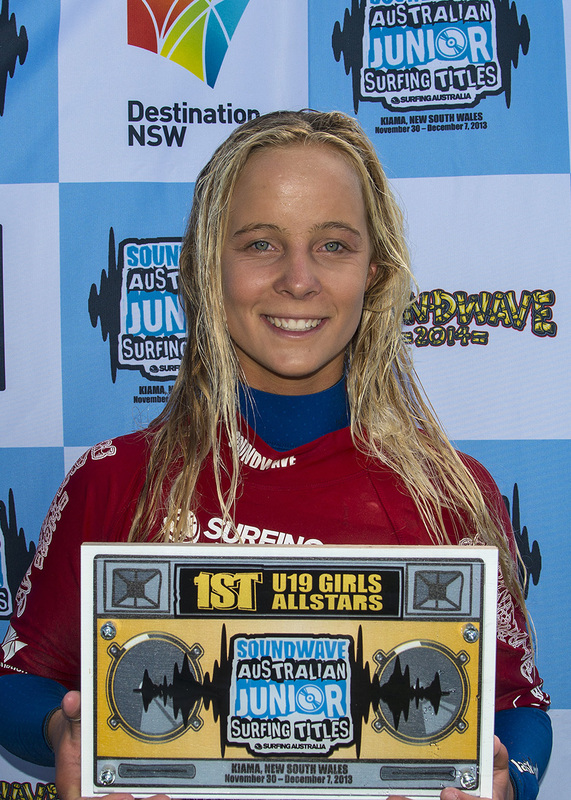 16-year-old Coolum surfer Isabella Nichols got the best Christmas present she could hope for when she was crowned the new Soundwave Australian Under 18 Junior girls Champion at Werri Beach (NSW) on Saturday. Nichols went into the seven-day comp as the current U18 girls state champion and dominated early in both the individual and teams events. 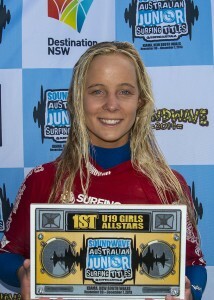 She easily won through the first round, scored runner up in the second round and went on to win her semi-final before tackling the solid 6 feet (2 meter plus) surf for the final showdown. After languishing in fourth position for most of the final, Nichols only jumped from fourth to first in the last minute when she secured a high score on her final ride. 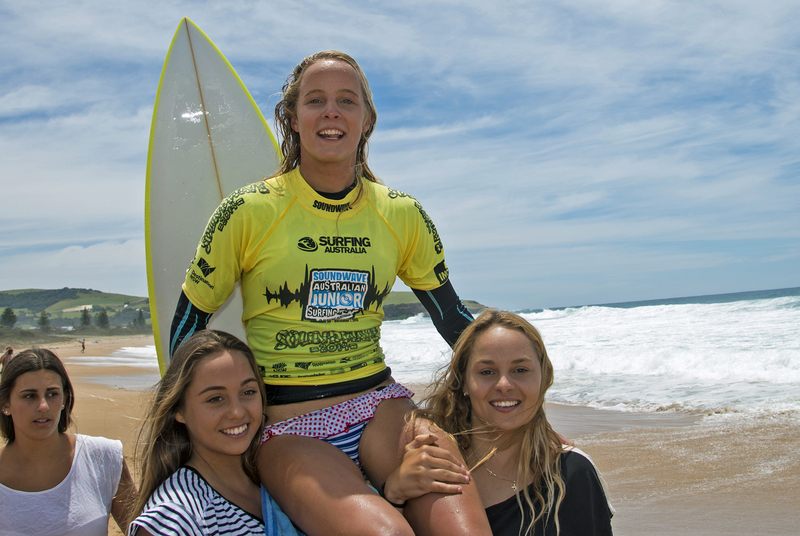 “I wasn’t nervous but more relieved to finally get a decent wave at the end,” she said. Joining Isabella on the winner’s podium was new Soundwave U18 Australian Boys Champion, 15-year-old Fraser Dovell from NSW. Dovell, who was competing at an Australian Junior Titles event for the first time, surfed a final almost identical to Nichols, coming from behind to post an outstanding 9.5 ride on his final wave and steal victory. 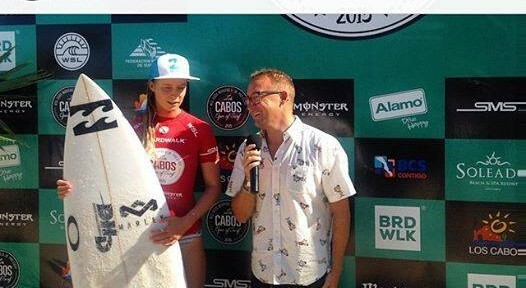 Nichols was a standout competitor all week and her win was later complemented with the ‘Isabel Letham Award’ for the most promising emerging female surfer at the event. U16 Boys Australian champion Joe Van Dijk (Vic) was awarded the corresponding Duke Kahanomuku award as the most promising emerging boy surfer. 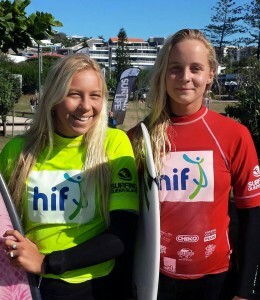 The accolade topped off a huge week for the Coolum-based Nichols who, together with Queensland’s Jade Wheatley, also scored a win in the All Star Schools U19 Girls division on Friday. 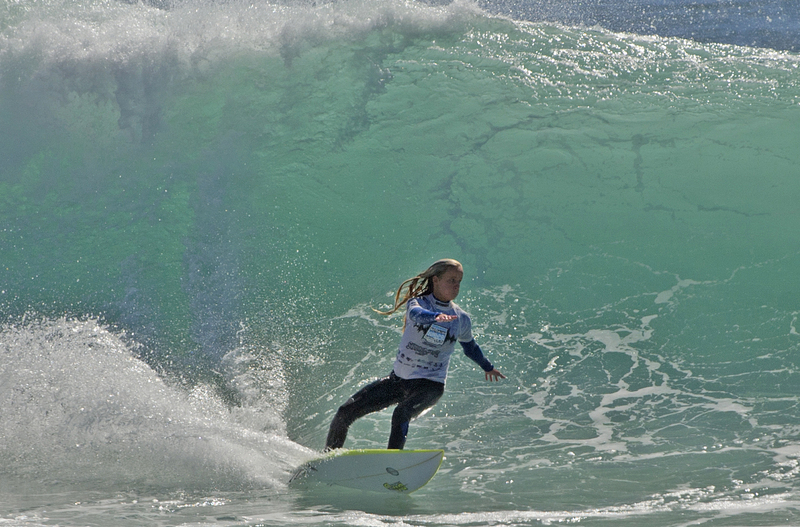 Day one of the event saw fellow Coolum surfer Jaleesa Vincent score the highest wave of the U16 Girls division, with consequent heats seeing her advance to the semi-finals before being knocked out while Wurtulla’s Laura Poncini advanced. The Coolum girls also paired up for the Mark Richards Shield event, but bowed out in the final stages. They were among several other surfers flying the Sunshine Coast flag high throughout the prestigious national event, with their combined point scores helping to secure an overall first place ranking for team Queensland. Laura Poncini placed third in the U16 Girls final, also pairing with Lucy Callister to take out the U16 Girls All Star Schools division. Sunrise Beach’s Quinn Bruce and Connor Lyons of Castaway’s Beach placed third and fourth respectively in the Boys U16 national final, while Wurtulla’s Kai Hing ended his title campaign in a semi final clash with 16-year-old Jacob Wilcox (WA), who made headlines after beating Kelly Slater in Portugal last month. Copyright laws apply to all images. Copyright retained by The Anderson Outlook. It is an offence to copy, print or publish any images without the express written consent of the owner. 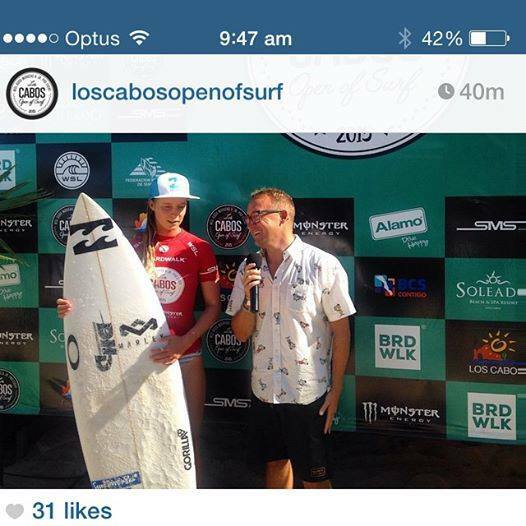 It was news that shook the surfing community across Australia quiet literally from coast to coast. 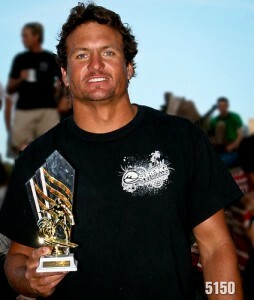 Chris Boyd, better known to his friends as “Boydy”, was tragically killed by a shark while surfing the popular surf break Umbies, off Gracetown, about 270km south of Perth, on Saturday, 23rd of November. The 35-year-old, who grew up in Yaroomba, had only moved to Western Australia with his partner Krystle Westwood a year ago, having been a well-loved and respected member of the Coolum Boardriders Club and wider surfing community. Members of the tight-knit local surfing fraternity have been rocked by the tragic news, but were quick to pay tribute to the plumber and father-of -two. Coolum Boardriders Club President Daryl Maudsley said the “loveable rogue” had made a significant, positive impact on the Coolum community, helping innumerable young surfers by mentoring them both in the surf and life. Tom Innes past President of Margret River Boardriders was clearly shaken when he spoke of the loss, “It was a perfect morning he (Chris Boyd) had a fair walk from the car park to that spot. The water was crystal clear, there was 3 – 4 ft hitting and perfect A frame peak.” Tom was confident that Boydy would have been enjoying some fine waves in idyllic conditions. 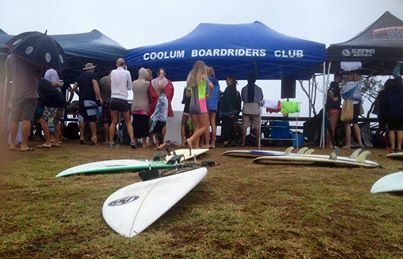 Coolum Boardriders and Margaret River Boardriders have joined together to pay respect to their mate. Brett Hardy the current President of Margret River Boardriders Club accepted a wreath from the Coolum Boardriders Club along with some sand and water from Yaroomba and it was used in the tribute ceremony, a paddle out for Boydy in Western Australia . On Sunday morning the Sunshine Coast surfing community held its farewell for the man they lost so tragically in Gracetown, and the sand and water from the waters Chris Boyd died in were released at his favourite place, his home Beach Yaroomba in the paddle out last Sunday morning. The 35 year old Member of Coolum Boardriders was a great club man and a talented surfer. 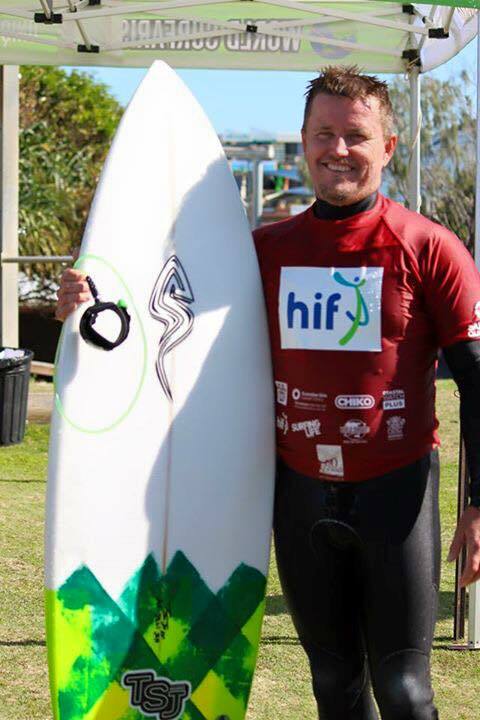 He was past Club Champion and Club Captain and will be well remembered as mentor to many young surfers. Boydy … Lived by the sea, died by the sea. 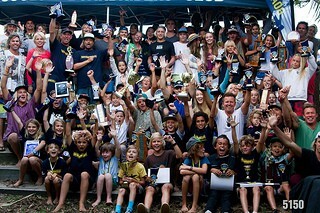 Coolum Boardriders held its Champion of Champions comp and end of year presentations on Sunday the 1st of December. The novelty comp where all club members surf ing one division against everyone else was as always a great day with fantastic surfing. The contest finished in the afternoon, once everyone scrubbed up the presentations were at the clubhouse. The results for the year are posted below.